The Times Square New Year's Eve Ball drop on December 31st is a global celebration on the grandest scale. As the world celebrates New Year's Eve with Waterford in Times Square, we ring in 2019 with the Gift of Harmony. Like music's harmonic chords, the gift of harmony seeks refuge of accord and compatibility amid the discourse of the world for the betterment of all. 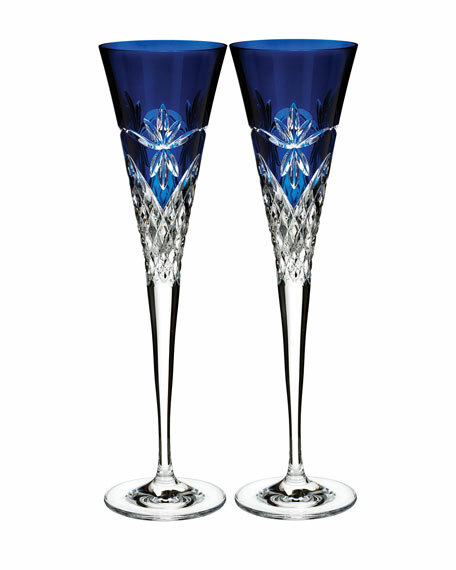 Featuring a stunning pattern with breathtaking cuts, this elegant Times Square Flute Pair, in a bold Midnight color, is ideal for toasting to the new year. Presented in a classic Waterford box with a decorative Times Square sleeve, this item is great for gifting. Set of two champagne flutes. Each: 3"Dia. x 11"T; holds 4.6 ounces. For in-store inquiries, use sku #2683923.